Viewfinder adjustment dial: Rotate this dial to adjust the viewfinder focus to your eyesight. Command dial: After you activate certain camera features, you rotate this dial to select a setting. For example, to choose a shutter speed when shooting in shutter-priority (S) mode, you rotate the Command dial. Zoom In button: In playback mode, pressing this button magnifies the currently displayed image. Note the plus sign in the middle of the magnifying glass — plus means enlarge. Display thumbnails during playback: After you press the Playback button to shift to playback mode, pressing the Zoom Out button enables you to switch from single-image view, which shows one photo or movie at a time, to thumbnails view, which displays multiple images on the screen. Press once to display 4 thumbnails; press again to display 9 thumbnails; and press a third time to see 72 itty-bitty thumbnails. A fourth press shifts the display to Calendar playback, which makes it easy for you to locate pictures taken on a particular day. To cycle back to thumbnails view, press the Zoom In button; keep pressing to reduce the number of thumbnails until you get to single-image view. Display help screens: The question mark symbol above the button is a reminder that you can press this button to display helpful information about certain menu options. i button: During shooting, pressing this button activates a control strip on the Information and Live View displays, enabling quick access to certain picture settings. LV (Live View) button: As its name implies, this button turns Live View on and off. In Live View mode, the scene in front of the lens appears on the monitor, and you can’t see anything through the viewfinder. You then can compose a still photo using the monitor or begin recording a movie. Multi Selector/OK button: This dual-natured control plays a role in many camera functions. You press the outer edges of the Multi Selector left, right, up, or down to navigate camera menus and access certain other options. At the center of the control is the OK button, which you press to finalize a menu selection or another camera adjustment. Release Mode button: Press this button to display a screen where you can select the shutter-release mode. By default, the option is set to Single Frame, which results in one picture each time you press the shutter button. 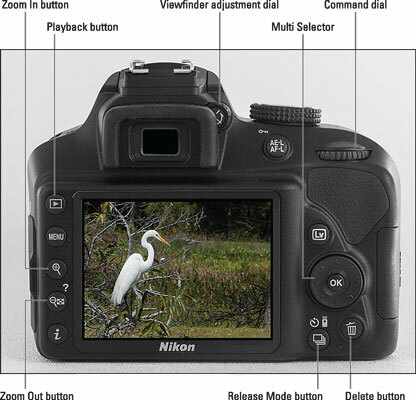 Use the Multi Selector to navigate menus and access certain other camera options.